Lectronix engineering design services has a proven track record of helping our technology clients design and develop new high reliable electronic devices. Our highly experienced product development team can provide your company with creative and cost effective product solutions in all aspects of your product design. 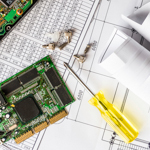 Our development team of hardware and software engineering specialist are capable of taking your project from concept, to prototype development all the way into production. We also allow the client to begin work with us at any point in their development cycle to help shorten development time while meeting their market introduction targets. Working with Lectronix is like working with an extension of your own engineering department. We will adapt to your processes and procedures seamlessly. A Project Manager will be assigned to your project to ensure your objectives are met. Reports detailing schedule, status, deliverables and budget are routinely provided. Contact Lectronix today for information on how we can help bring your product to market.